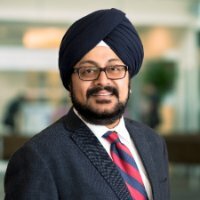 Irvind Ghai serves as Vice President for the Connectivity Business Unit of Qualcomm Technologies, Inc. (QCT). In this role, he oversees product management and business development for Wi-Fi, mmWave 11ad and 4G/5G Small Cell solutions for Enterprises and Carriers. Irvind has played a key role in driving the wired and wireless infrastructure networking business. He has led double-digit growth by working across technologies to offer the best connectivity approach across unlicensed and licensed spectrums, arriving at the most optimal answer for enterprise verticals that include education, hospitality and healthcare. Irvind joined Qualcomm through the Atheros acquisition in 2011. Prior to that, he spent 14 years at Texas Instruments, where he worked with Service Providers to define product market strategies for DSL, DOCSIS, Video and VoIP platforms. During his career with Texas Instruments, Irvind has had a proven track record of developing successful product lines, driving P&L growth and leading strong engineering and marketing teams. Irvind holds an MBA from University of St. Thomas, a Master’s degree in Electrical Engineering from Purdue University, and a Bachelor’s degree in Engineering from Calvin College.